King Georges Hall | The Bluetones are back! The Bluetones are set to make a welcome return to the live forum with a stop at Blackburn’s King George’s Hall this May. The band, a huge part of the Britpop era, were always an engaging and dynamic live outfit. Fronted by the enigmatic Mark Morriss, they had an impressive run of hit singles including ‘Bluetonic’, ‘Slight Return’, ‘Marblehead Johnson’, ‘Solomon Bites The Worm’, ‘If’ and ‘Keep the Fires Burning’. Their live shows brought the West London four-piece an army of devoted followers worldwide. Formed in Hounslow in 1994, the group consists of guitarist Adam Devlin, drummer Eds Chester, vocalist Mark Morriss, and his brother Scott, who played bass. 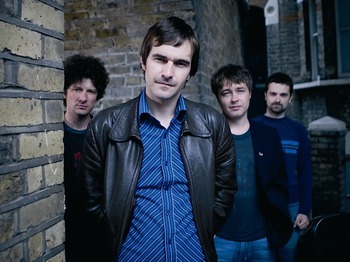 Early in 1996, the Bluetones released “Slight Return,” which shot to number two a month before their debut album, Expecting to Fly, was released. It debuted at number one on the British charts and became a sizable hit. The Bluetones are credited with filling the gap that the Stone Roses left behind, providing graceful but muscular guitar pop with slightly psychedelic overtones. Glastonbury and Top of the Pops, The Bluetones did the lot and toured with everyone from Radiohead to Bruce Hornsby & The Range. Finally, after playing more than 10,000 shows in more than 73 countries, they’re back for more. The Bluetones are promising a sensational show this May as they plunder their incredible body of work one more time, playing their most popular songs.